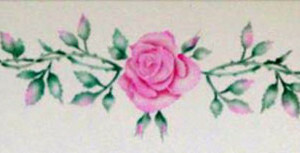 A beautiful rose stencil for stunning walls and furniture. Shabby Chic for sure! 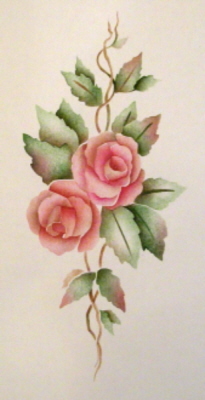 This delicate Rose spray stencil gives you plenty of options. 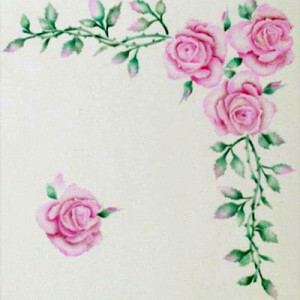 Repeat this stencil as a gorgeous border, stencil it inside of painted wall or ceiling frames as a frieze or use it as a central design anywhere (closet doors in your powder room?). As a special touch, once stenciled, try adding bits of metallic gold paint to the leaves and edges of the rose petals and watch it take on a truly elegant look! 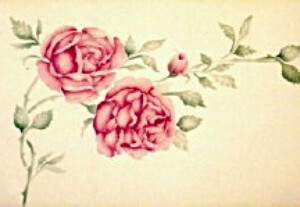 I love rose stencils. 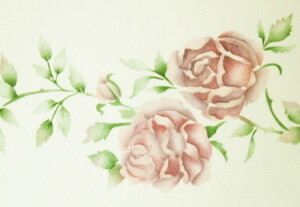 They add not only add a bit of “garden” feel to any room but they also evoke “romance”. 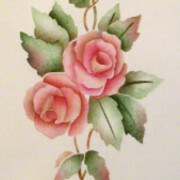 Stenciling roses on furniture has long been an exciting and beautiful way to create a shabby chic furniture make over. Paint the furniture white first, scuff it lightly with sandpaper to create the look of worn or antique paint, then stencil with roses. Beautiful!